Click Workspace’s new home on Market Street was built to not only serve its growing coworking community, but to help fill the void in small performance venues in downtown Northampton. Since last spring, Click’s flexible, artwork-filled space has been serving the need for 100-seat and smaller rooms with a growing roster of performance and literary events. Now the venue introduces its own series, Click Music, which invites audiences to up-close encounters with artists experimenting with their music making. Click Music premieres on Thursday, January 26th in the first floor event space at 9 ½ Market Street. 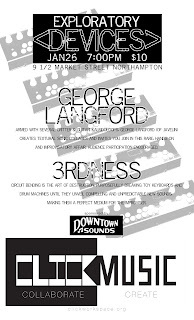 The 7:00 p.m. concert, themed “Exploratory Devices,” features a double-bill shared by George Langford (Javelin) and Noam Schatz’s 3rdness. Click Music is curated by Anand Nayak and sponsored in part by Downtown Sounds. 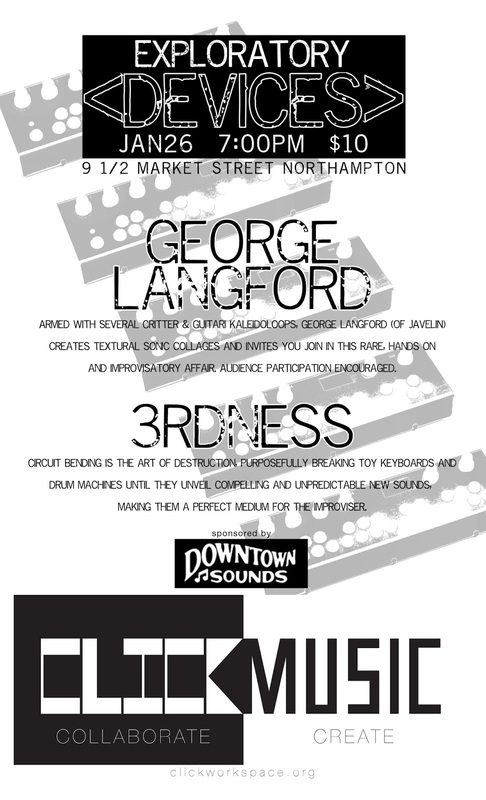 Armed with several Critter & Guitari Kaleidoloops, George Langford of the band Javelin creates textural sonic collages and invites you join in this rare, hands-on and improvisatory affair. Langford began Javelin with his cousin Tom Van Buskirk in 2005, and their eclectic music focuses mostly on a mellow electro-pop/80s-synth style. The band has played hundreds of events, including Lollapalooza. Their production techniques have a history of fostering audience participation, and that will also be encouraged in Langford’s solo “Exploratory Devices” set. 3rdness is the nom de noise of Noam Schatz, a veteran of the Valley music scene, usually found behind the drums of rock and rolling bands such as The Capitulators and Endless Mike (in former lives, Schatz has played with local luminaries Mobius Band, Meathawk and the Meathawks, The Sometimes, and the Sun Parade). Circuit bending is the art of destruction, purposefully breaking toy keyboards and drum machines until they unveil compelling new sounds. The juggling and tossing of stray electrons. The weaving and warping of synthetic tones and noises. There is an inherent unpredictability in the circuit bent instruments, making them a perfect medium for the improviser. Once the music begins, not even the electrons know how it will turn out. Tickets are available at the door for $10 cash. Beer and wine will be available. Event information is available at http://clickworkspace.org.